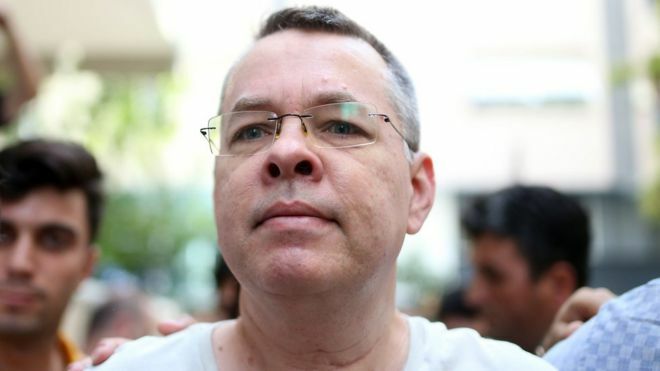 According to the indictment against him, the American pastor Andrew Branson is active in "supporting two terrorist organizations," and expressed his displeasure at the failure of the coup that would shake the Turks and create the conditions for the return of Christ, as he put it. The prosecutor in Izmir accused Pastor Branson of committing crimes on behalf of the organizations of the Fatah-Gulen and the PKK, which Ankara classifies as terrorist movements. The indictment included text messages sent by the priest to those working with him, including his regret over the failure of the coup attempt against the Turkish government in mid-2016. "We were waiting for events to shake the Turks, and the conditions for the return of Jesus (the Prophet) were set, and the coup attempt was a shock," says one SMS letter. "Many Turks have trusted the military before, but this time it was too late, and this is another shake-up after the coup attempt, and I think the situation will get worse and, in the end, we will win." The statement also contained the content of another letter sent by Branson to one of the American military, expressing his sadness at the failure of the attempted coup on July 15, 2016. According to the indictment, the US pastor used the religious umbrella during his work for the Gulen and the Kurdistan Workers' Party and he cooperated with them despite his knowledge of their aims. Branson met senior members of the Gulen organization with knowledge of their kinetic names. The US Treasury Department has imposed sanctions on Turkish Justice Minister Abdulhamid Gul and Interior Minister Suleyman Soylu for the case of Rev. Andrew Branson. White House spokeswoman Sarah Sanders said the financial resources for both would be frozen and would prevent any financial dealings with them from US sources. The Turkish foreign ministry protested strongly against US sanctions and called for a retreat from what it called the wrong decision, which cannot be explained by the concepts of law and justice. "We will respond without delay to this hostile American stance, which does not serve any purpose," a statement from the Turkish foreign ministry said. "The US sanctions resolution constitutes an improper interference against Turkey's legal system and will seriously damage the efforts to restore relations between the two countries. It also contradicts the essence of relations between Ankara and Washington." Local media quoted Turkish President Recep Tayyip Erdogan as saying that his country would not back down from US sanctions and would not conclude a deal on Reverend Branson. The Turkish presidency stressed on Thursday that the United States "will not get the result" you want, the release of Rev. Branson by making "unacceptable" threats.